Heat the oil in a large pan, add the chicken, then fry until lightly browned. Add the veg, then fry for a few mins more. Stir in the herbs and stock. Bring to the boil. Stir well, reduce the heat, then cover and cook for 40 minutes, until the chicken is tender. Stir the beans into the pan, then simmer for 5 mins. 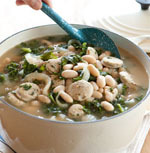 Stir in the parsley and serve with crusty bread.